Former prime minister Brian Mulroney is giving advice to the Liberal cabinet committee overseeing the Canada-U.S. relationship. Brian Mulroney returned to his old stomping grounds on Parliament Hill Thursday morning, briefing the Liberal cabinet committee overseeing the Canada-U.S. relationship about the negotiations that endanger one of his key achievements as prime minister. 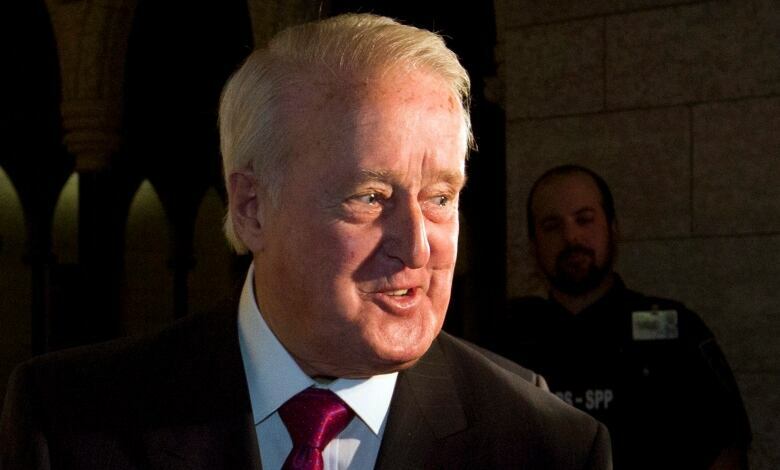 "This is the way I used to go in for a decade, so I feel pretty good about it," Mulroney told reporters Thursday as he entered Centre Block by the west entrance. The Liberals are now calling themselves a party of free trade, decades after a bitter election campaign fought against Mulroney's Progressive Conservative party over free trade with the United States. Mulroney, who served from 1984 to 1993, has been advising Justin Trudeau's government since the election of Donald Trump as U.S. President last year. "It was as if I never left," Mulroney said. Trump has promised to renegotiate NAFTA and has criticized the deal repeatedly, blaming it for the loss of U.S. manufacturing jobs to Mexico. Murloney, who negotiated the original North American Free Trade Agreement between Canada, the United States and Mexico in the 1990s, said the issues can be resolved but negotiations will take serious work. "I think they're going to be challenging," Mulroney said after the meeting. "You've listened to Mr. Trump's campaign statements, then he met with the prime minister and he seems to have adopted a pretty reasonable posture, and then the [United States Trade Representative] comes out with a different version of things, so we'll just have to wait and see." Mulroney noted Trump won't be at the negotiating table himself and will likely appoint the best negotiator he can find. He said the main issues for Canada will be country-of-origin labelling and preserving the independent dispute resolution mechanism. "There will be meat to talk about. It's been 25 years that it's lasted, so we have to make some important decisions," Mulroney said in French when asked whether the renegotiations would just be a "tweak." Trudeau was not at the cabinet meeting himself. He is in New York City today on his fourth visit to the United States this year. Cabinet ministers have been making regular trips to the United States, meeting with American counterparts and making the case for protecting market access under NAFTA. David MacNaughton, Canada's ambassador to Washington, attended the cabinet committee meeting as well. He said the government has been drawing on a broad swath of Canadians to engage with the Americans. "Whether they be Conservatives, Liberals, NDP, whether they be provincial governments, whether they be the business community, everybody has leaned in and said, can we help?" MacNaughton told reporters after the committee meeting. "Brian Mulroney's been very helpful. He's got some great insights." MacNaughton said 73 per cent of Canadian exports and 9 million American jobs that depend on trade with Canada are on the line, so both sides are looking to get a good deal. "The Americans aren't slouches in terms of their negotiations, but neither are we," MacNaugton said. "What we've done is we've established a good working relationship with the U.S., with the administration, and we're going to do the best we can to defend Canada's interests." Mulroney also has personal relationships with both Trump and U.S. Commerce Secretary Wilbur Ross. Mulroney regularly vacations near Trump's Mar-a-Lago property in Florida. NDP Leader Tom Mulcair questioned Mulroney's mandate in the upcoming negotiations and whether or not he's receiving compensation from the government. "What's his position going to be other than to defend the deal that he put in place in the first place?" Mulcair said in the foyer of the House of Commons Wednesday. "It goes back to Justin Trudeau again. What is his position on NAFTA? He hasn't articulated one." The PMO said Mulroney is not being paid. Asked about the meeting at a press conference in New York, Trudeau said that ever since Trump's election, his government has looked for ways to press the Canadian case in Washington and Mulroney was part of that effort. "I want to thank former prime minister Mulroney for having been there to connect with us and to aid in the discussions back and forth," Trudeau said. "Working well with the United States is not a partisan issue. It's one that we can all align on." Describing Mulroney's advice as "thoughtful and helpful," Trudeau said he was pleased to have been able to tap into Mulroney's experience and insight. "It was particularly nice support and help for this government to be able to count on the former prime minister to share his perspective on how we can move forward on an important relationship." Derek Burney — Mulroney's former chief of staff and Canada's ambassador to the U.S. during the original NAFTA negotiations— also attended the meeting to offer his insight at the request of the committee's chair, Transport Minister Marc Garneau. Burney, a diplomat prior to joining Mulroney's office, played a central role in negotiating both Canada's bilateral free trade agreement with the United States and the NAFTA talks that followed.